Though I've never supported GOP policies, I kind of liked Bob Dole at one time. He's quick-witted and sarcastic. I have a weakness for people who can think on their feet, and I've always kind of felt there were too few of them. But one day Dole started attacking teacher unions. He made a distinction--not the teachers, but their unions. We will rescue kids from failing schools by helping their parents send them to a safe school of their choice. My opponent would rather protect bureaucrats than serve American children. What are "failing" schools? They are always correlated with high percentages of high-needs and poverty, neither of which is addressed by either Daddy or Junior. Who are the nameless bureaucrats? I'm thinking we are. School "choice" is about folks like Trump sticking their greedy little fists into public funds earmarked for our children. If they had to send their kids to public schools, you'd better believe they wouldn't be treated like the ones in Detroit. I am not in love with Hillary, but you don't need to be a genius to see Trump adjusting the targets on our backs in preparation for a direct assault. On Facebook, I now see people rationalizing this by saying he isn't going after teachers, but rather the teacher unions. In case it isn't absolutely clear, you are the union and I am the union. We are the union. Michael Mulgrew is the elected President of the union, but I happened to see him walk past me yesterday, and I can assure you he is one guy. I counted, and I was wearing my glasses at the time. Regular readers of this blog know I have an issue or three with union leadership. I have issues with the way the union is run. I have issues with what passes for democracy in our union, and I may perhaps have mentioned this once or twice in this space. But, as a friend of mine used to say, "There are two problems with the union--the leadership and the membership." I agree, and if there are problems with OUR union, it's on US to fix them. But outsiders don't get to say, "I have no problems with teachers. I just don't like the union." It's kind of like saying, "I have no problem with you. I just hate your family." Or, "I don't mind your family. I just hate your mother." Sorry, guys, but it's OUR family. If you don't like our family, you don't like us. We call one another brother and sister, and it's not because we have the same parents. It's because we have chosen to stand together. 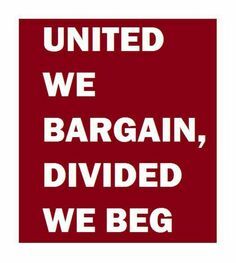 When you attack our union, you attack us, and we stand together against you.